Last year, Saint Francis Catholic Secondary School and the members of the youth engagement committee planned a Mental Health and Wellness Day. During this day, we had agencies from the community come in and set up displays. This allowed the students to see what agencies were available to them and how to access services. We invited partners such as Contact Niagara, Pathstone Mental Health, CASON, COAST, Niagara Catholic’s Social Workers, our Public Health Nurse, Family and Children Services and Kids Help Phone. We created a school pen with all the information that students would need to access services. 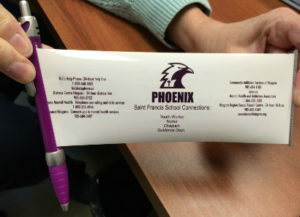 The pen has a pullout leaflet and tells them who they can call and websites to visit. Most of the agencies engaged the students by handing out pens, merchandise and pamphlets. We also created a mental health trivia questionnaire that students could fill out and enter to win a headset. Overall, the event was well received and we will continue to have this day each year. 86.8% of Ontario students report that they feel that they belong at school.